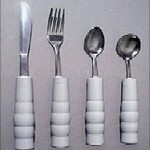 KEatlery Weighted Utensils greatly reduces hand tremors! KEatlery utensils are weighted utensils with the look of high quality stainless steel utensils and in fact they are high quality 18/8 stainless steel. You will be able to dine with these utensils and no one will be the wiser. Cuts down on the tremors and looks like the stainless in everyone's home. Why use utensils that are unattractive when you could be dining with KEatlery? The handles of these stainless steel utensils are solid, which gives them their extra heavy weight. Each utensil weighs around 7.3 ounces to make them heavy enough for those suffering from Parkinson's, Ataxia or other illness which cause tremors or shaking of the hands. A slight indentation on the handles places the fingers in a comfortable, ergonomic position. The soup spoon has a recessed edge and slightly deeper bowl to assist in preventing spilling. These lovely utensils are institutional dishwasher safe. The utensils are between 7 - 9 inches long, depending on the piece. 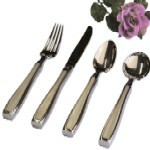 Sold as a set of four utensils. 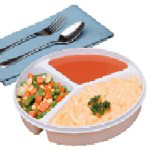 Partitioned scooper plates have three sections like heavy duty paper plates with three separate compartments. High rims for pushing your food onto forks or spoons. Prevents food from mixing as it is scooped. Comes with plastic lid.